Mormon Mommy Writers and Friends: SEEK, ASK & KNOCK! Our lesson both in Sunday school and Relief Society seemed to send us the same message today. It always amazes me when this happens, because I know that this means that it is an important one. It's just like when you are searching for an answer and there seems to be the same message coming from different sources, or in different ways. For me, this usually means that I am not really listening, or that I don't want to hear the answer Heavenly Father is trying to give me... that's the stubborn genes that my parents argue over which side it comes from. A very interesting thing happened when I contemplated what to write about today. I was so at a loss as to where to start. I found all kinds of doubts start to enter my head, as I'm sure everyone has experienced at some point. So many thoughts ran through my head, but nothing felt right. I almost gave up! (pathetic I know!) But then I went to read my scriptures for the evening, and there was my answer! "Draw near unto me and I will draw near unto you; seek me diligently and ye shall find me; ask, and ye shall receive; knock, and it shall be opened unto you." 1. Remember that prayers are not answered every time or in the way that we think. Sometimes our prayer being answered is an unanswered one. The majority of the time we are going to our Heavenly Father because we don't know what is best for us, and need his direction. This means that we need to accept the answer he 'gives'. 2. Prayers are not answered the same way for every person. We are all so very different, and therefore cannot expect our answers from God to come the same way either. In fact, The Lord needs us to be different in this way so that we can bring to pass his purposes and serve ALL of his children. 3. When we seek for answers to prayers, we cannot allow our emotions to rule us. Emotions have its place, as it is often the reason we are brought to our knees. But if we allow it to consume us it can not only cloud our minds as we ask our questions, but it can prevent us from receiving the true answer we need. We must deal with the emotions best we can, and do our best to approach this process as logical as we can. It does not mean devoid of emotion, but being in control of them. There are so many other aspects and ideas on this one, and this subject is so much greater that my few thoughts. But I hope that it got you thinking, and I'd love to hear any you have to add! 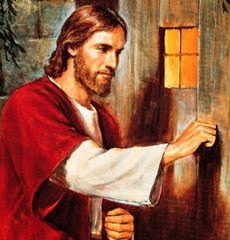 Remember-----> SEEK, ASK & KNOCK! <3 Have a fabulous week!